Flour Drum Newtown has been instagram famous for sometime now so I figured it was time to go try it, see what all the fuss is about. I can now confidently tell you that YOU HAVE TO GO! 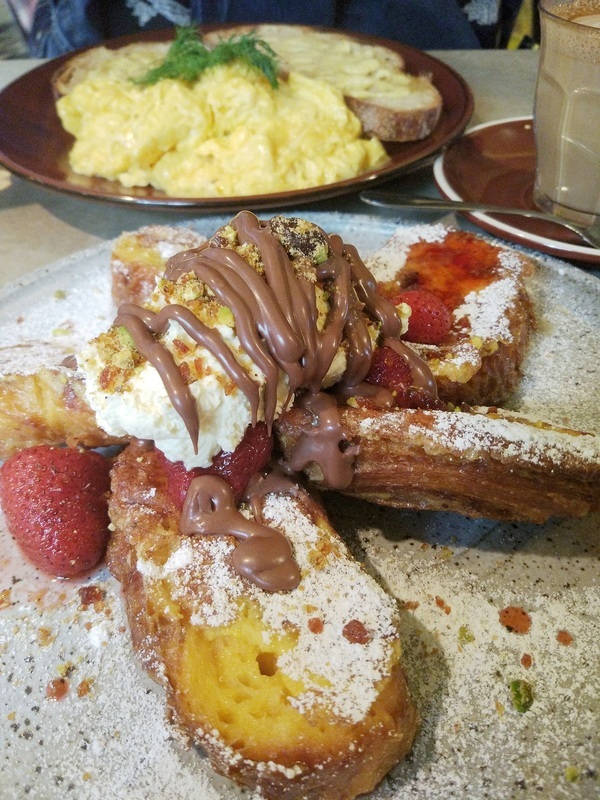 I had the french toast with mascarpone cream, candied nuts, poached strawberries and chocolate sauce. IT WAS AMAZING. I pretty much licked my plate clean. The only thing is that maybe I could have used a little more chocolate, but that's probably just me and my fanatical chocolate ways. It's an extremely heavy dish but I powered through and ate everything of my plate. Yes, my parents are very proud of me. While I had the plate full of decadent totally worth it calories my friend opted for something a little less guilty. She had scrambled eggs with toast. I did have some of hers and I have to say that the scrambled eggs at Flour Drum are very good as well! I may possibly go back and have that the next time. I will warn you though, the portion of scrambled eggs is no small thing. It's a fair amount and it's perfectly runny and not too dry. All in all, so worth the trip there. PS, if you're into coffee, it was pretty good here too. When I heard there was a Chocolate festival in Sydney, I knew I NEEDED to be there. I consume disturbing amounts of chocolate every single day so this is PERFECT for me. Unfortunately the actual chocolate festival was small and a bit disappointing, but not to worry, there were plenty of stalls around to pick up the slack. They were spread out all over The Rocks. Although I did question some of the booths, they were selling savoury food, which I'm sure were good, but like what are you doing here? MAKE SPACE FOR THE CHOCOLATE. Maybe my thinking might be slightly excessive but CHOCOLATE. I'm sure you can't tell how passionate I am about chocolate from all the capital letters. I will also warn you, as I'm not a very good blogger, if I could be considered a blogger at all, I don't really know the names of some of these booths. Sorry, guess you'll just have to go next year and try it for yourself. We stopped at a few booths that I thought worth mentioning. I'll start with my first meal (yes, I'm calling them meals). Double chocolate ice cream, dipped in milk chocolate, coated in chocolate cookie crumble. Then, we had some cupcakes, pictured above are the Nutella cupcakes, but don't be fooled, we also had a salted caramel cupcake and a Tim Tam cupcake. I will say that the icing was absolutely AMAZING, however, the actual cupcake was a little disappointing. Last but not least were my chocolate bars, which I have just finished this afternoon. They were by ChocoLab, OHMYGOSH, these chocolate bars are just SOOOO SOOOO GOOD. I will admit they are over priced at $12 a bar, but you know me, chocolate? Worth it. I got the peanut butter and pretzel bar as well as the nutella bar. 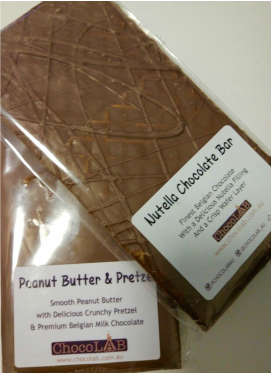 The peanut butter and pretzel bar is pretty self explanatory, It's just a chocolate bar filled with peanut butter and pretzel pieces, but with the perfect amount of pretzel. The nutella bar, is just YASSS. It's a chocolate bar with a layer of nutella and a wafer in between the nutella and chocolate, but the wafer is perfectly thin and crispy. These are SUPER expensive chocolate bars but I would totally buy them again, not so often, but once in a while to treat myself. I am currently still mourning the loss of those bars, so I'm stuffing my face with toblerone as I write this. 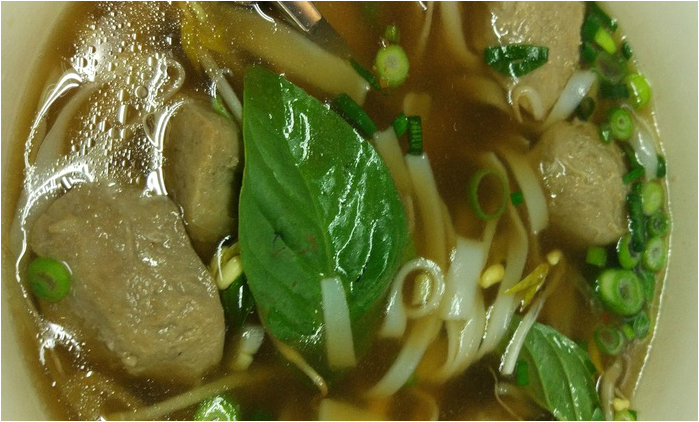 Pho Toan Thang. I was feeling a little homesick and needed something that reminded me of my morning breakfasts with my dad. We would go out for breakfast every morning at our local coffeeshop and I would have my favourite noodles, pork ball noodles. 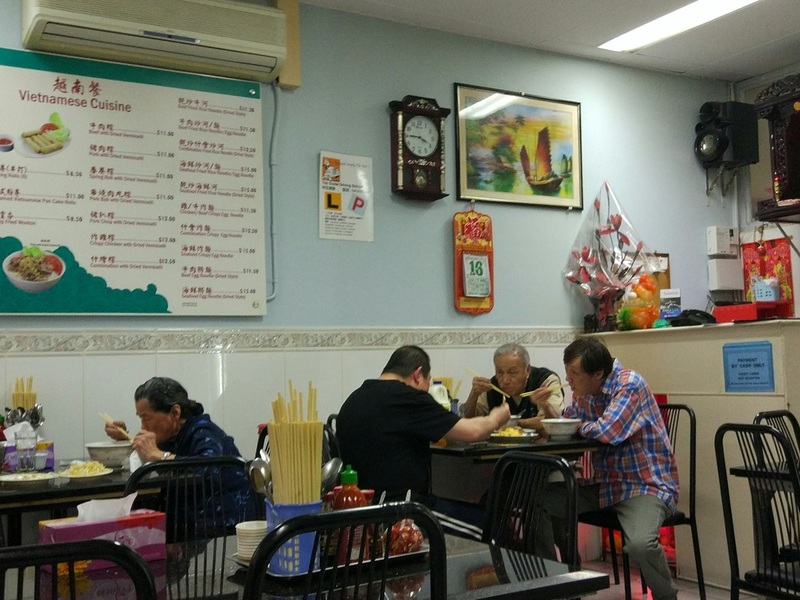 So when my friend met a friendly old lady on the train who swears that this is the best place for rice noodles in Sydney we obviously sought this place out. We took the train to Flemington and right outside the train station were a bunch of coffeeshops and roast duck stores that reminded me of home. They even had a place selling sugar cane juice! This place was a Vietnamese restaurant but it had a mix of some other asian food in there as well. I didn't try it but I saw seafood laksa on the menu too. This place wasn't all noodles, there was rice, fried or with stir fried vegetables or meat (whatever you want to order). They had egg noodles as well. The rice noodles weren't the smoothest that I've ever had but still, it was above average noodles. I would consider myself a rice noodle expert. 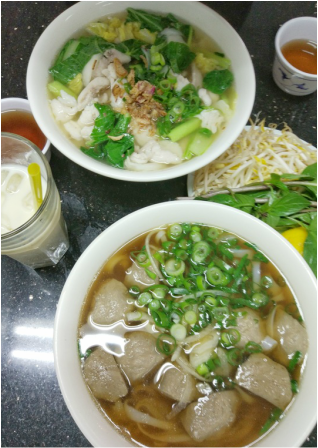 I had the beef ball rice noodle soup, the beef balls were very good. Probably like the best part I would say. What also got me really excited was the Soya milk. It's pretty much my favourite drink in the world, so you know I'm bound to order that. Overall a good experience, and I am definitely going back to Flemington for some roast pork and char siew!